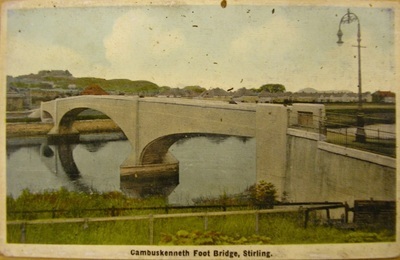 Cambuskenneth and Stirling are separated by the short breadth of the River Forth. Historically, a small ferry boat ran between the two shores taking people in either direction for a fee. 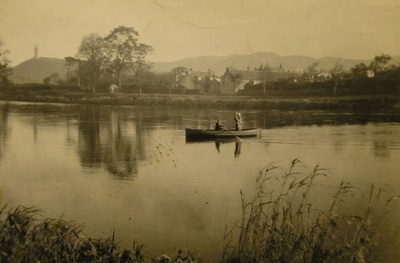 The alternate journey was the much longer route along Causewayhead and over Stirling Bridge – as indeed, it still is today. Although the idea of a small ferryboat may seem romantic and quaint and became the subject of dozens of attractive postcards and images in the early 20th century, it was in fact an unsatisfactory means of transport for those who had to use it daily. 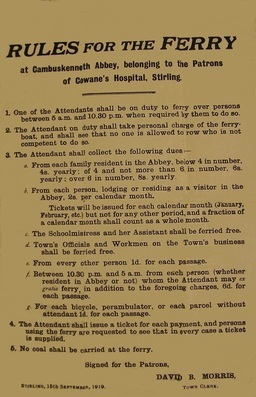 The crossing of the Forth was short, but also potentially dangerous when the river was in spate or the boat was overcrowded and further, the ferrymen (employed by Cowane’s Hospital) themselves had a long record of complaints against them by the local populace. 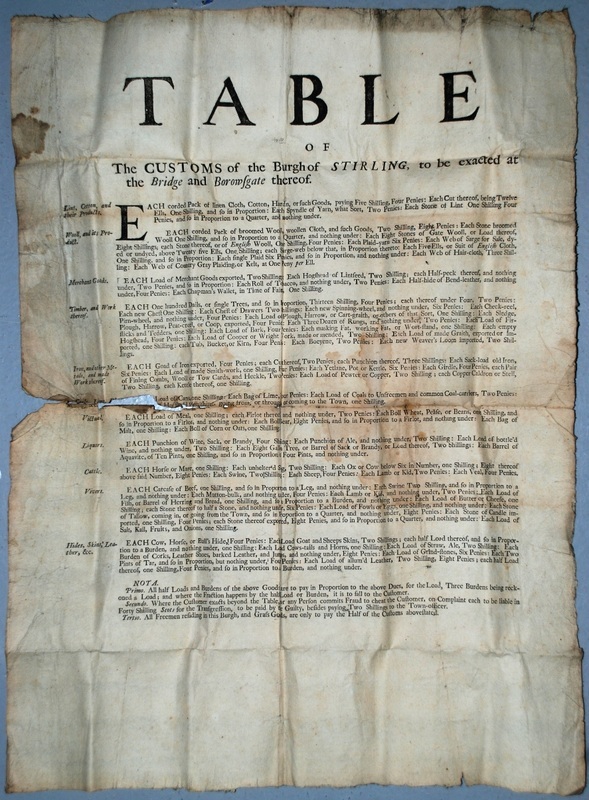 This is despite a set of rules being in place to govern the use of the ferry and outline the responsibilities of the ferrymen. There are records of ferrymen being complained about as rude, others lazy, some even fell out with and assaulted passengers, and the state of the boats and the piers distressed users of the service as well. However, despite general dissatisfaction with the service, it was a long time before the idea of a bridge became reality. As early as 1822 the construction of a bridge was discussed, but it was the 1930s before momentum really got under way. In 1933 a petition was raised by the people of Cambuskenneth asking for a bridge to be built and at last in 1935 the footbridge over the Forth was opened, allowing quick and easy access for people travelling in either direction. For more information on the Cambuskenneth Ferryboat and its history, please see ‘Cambuskenneth Ferry, between 1709 and 1935’ by Linda M. Chapman, published in the Scottish Local History Forum Newsletter, Issue 69, Spring 2007.